Fiesta based Crossover in the near future? 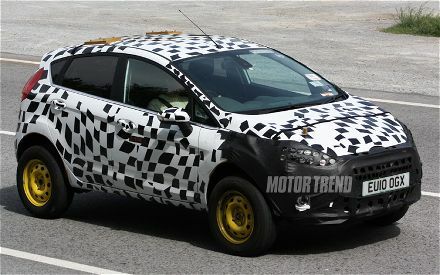 Ford may be preparing a Fiesta-based mini-crossover, judging by the looks of this prototype we just spotted undergoing warm weather testing. The vehicle could become a junior sibling to the slightly larger, Focus-based Kuga. That European-designed small crossover is rumored to be arriving in the U.S. next year. So, how may of you would like to see these available in Southern Maryland? I know we would like to see them on the lot at Waldorf Ford! For updates, become a Facebook fan or stop by and see us. Waldorf for is located on Route 301 north, just 15 minutes south of Washington DC,.